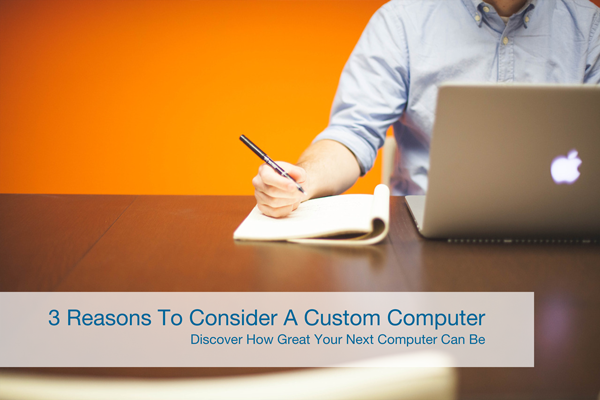 3 Reasons To Consider A Custom Computer. Most people I know have a tendency to find one thing that works for them and stick to it. I know I do that for certain things in my life, and it makes sense. We all like to have some stability and security in our lives, and that one particular brand of ice cream that can always lift your spirits after a long day is a good enough reason to buy five gallons of it at the grocery store. However, the same does not always apply to computers. If you have a brand you know and love that hasn’t let you down yet, by all means, buy the latest new laptop or gadget they just released. If you’re like me, though, and have hopped between computers for so long you don’t know where to turn next, I’m here to tell you that there is a solution that’s been right under our noses all along! I am of course talking about building your own computer. Building My Own Computer? Isn’t That Incredibly Difficult? That’s what I thought too before I tried it. If you’re feeling adventurous, you can follow a guide online that’ll show you what parts to purchase and how to fit them all together into a working machine. If you’re interested in the idea of a custom computer but would rather someone else worry about the logistics for you, many individuals or tech companies can build one to suit your needs for a small fee. You still have all the benefits and it’s as just as easy on you as ordering one online. If there’s one thing a custom build offers you, it’s full control over the hardware and software that get installed. If you want a machine for your business that is slim and appealing but won’t break the bank, you’ve got options. If you want a powerhouse that can handle any graphics or multimedia task you throw at it, you’ve got options. If you just want a basic machine that can handle documents and access the Internet, guess what. You can do that too. You can easily cut costs. Another big draw of custom computers is how inexpensive they are. When you buy a computer off the shelf from a name-brand manufacturer, do you ever wonder how much of your money is paying for their markup compared to the actual cost of the parts? I’ve been able to build computers with the same specifications as brand-name desktops for a fraction of the price, leaving more money in the budget for upgrades where they’re really needed. You still have warranties and support available. The lack of manufacturer support may seem like the biggest downside to a custom computer, but it might not be as bad as you think. The parts you order for your custom build still come with warranties to safeguard you against any issues that may arise. Your IT provider will also be able to service any custom built system with ease since the hardware inside is the same as what they’re used to working with. The number of options you have when purchasing a new computer or upgrading an old one are staggering. The problem is that there are seemingly infinite combinations of hardware and software you can purchase from a multitude of manufacturers and you’re left to find the best one to suit your needs. Building a computer is the exact opposite: you know what your needs are, so why not build the system that works best for you with the hardware and software you know you need?